We’re having a few floors redone in the house we bought. One of the floors is going to be replaced so that we can level it with a section of existing flooring in the adjacent space. 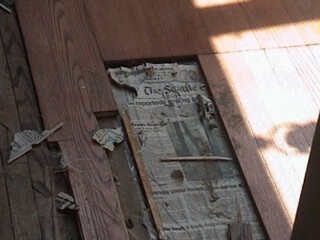 The flooring guy ripped up a few boards at the edge of the flooring to be removed, and discovered that the floor had been “leveled” using a unique subflooring material: newspapers. Aversion: Sleater-Kinney Announces Tour. Including two shows in Seattle. I’ve only been waiting for a few years to see them live. This should be good. Sorry about the lack of updates yesterday. I was busy becoming a real homeowner. To wit: painting the two-story vaulted ceiling in our great room. Walls to be done later today, assuming the floor refinishing guys knock off early enough to let the dust settle down (they’ll be sanding this morning). Apologies to all who tune into this blog for scripting, Mac, music, or other stuff. This is really going to be the Jarrett House North blog for a few more days—at least until our things get here. I start work a week from today and from that point on should be able to think about things other than home improvement.